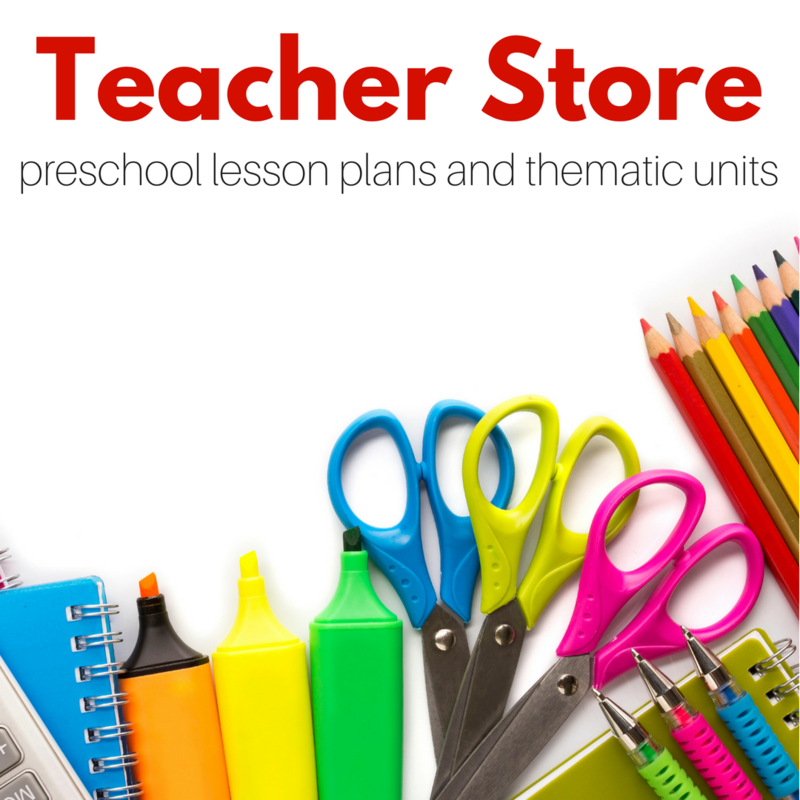 My classroom is a wash of red right now, like many other preschools, my school uses a curriculum with themes. 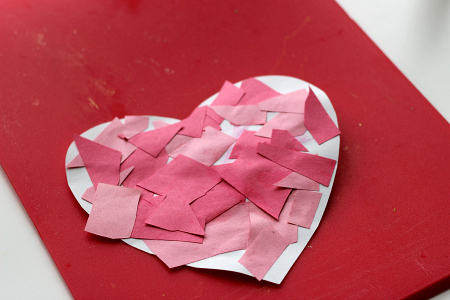 This month it is love and friendship, the color red, and the shape is… you guessed it a heart! 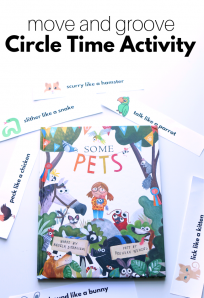 While I look more towards my students for the curriculum than the theme, I do like to incorporate holidays and celebrations into our day. 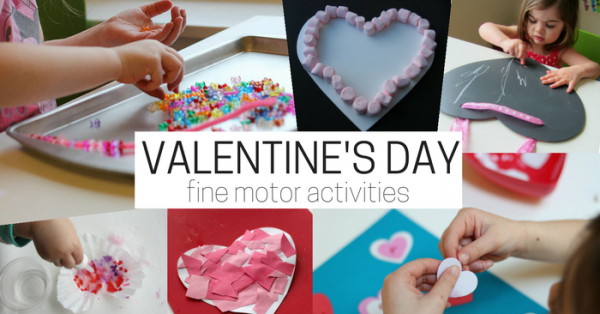 These are some great fine motor activities with a Valentine’s Day theme, but love and hearts can be used 365 days a year as a theme right? 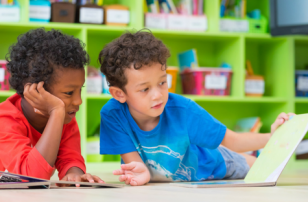 These activities help to develop the dexterity needed for writing, buttoning shirts, and even using a fork and knife properly. 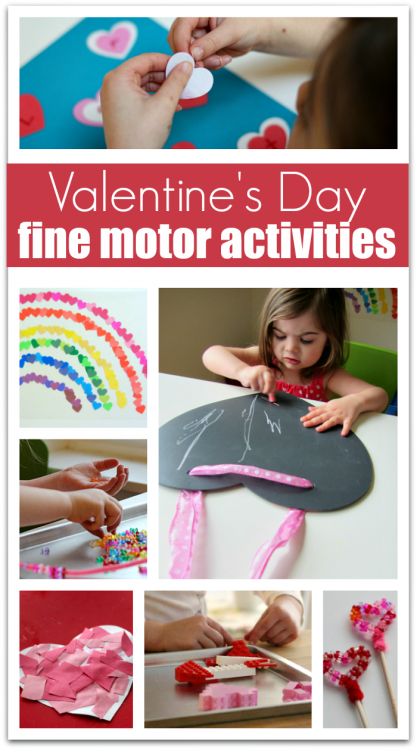 There is no reason not to have fun while working and these fine motor activities are definitely fun! 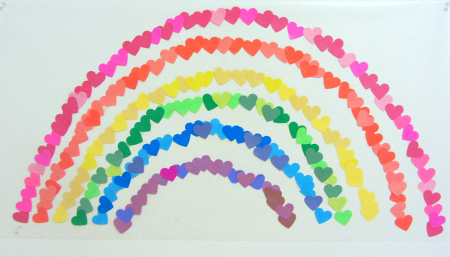 Rainbow Heart Wall – pinching and placing the small colored hearts on the contact paper works on hand-eye coordination as well as hand control. 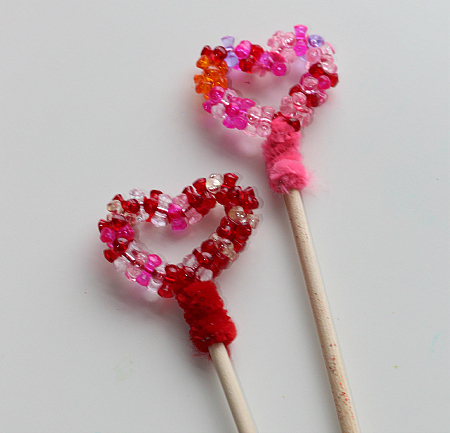 Bead Heart Wands – beading is tricky, and I love that this craft has some beading, but it won’t exhaust children and end up with sore fingers and no patience. 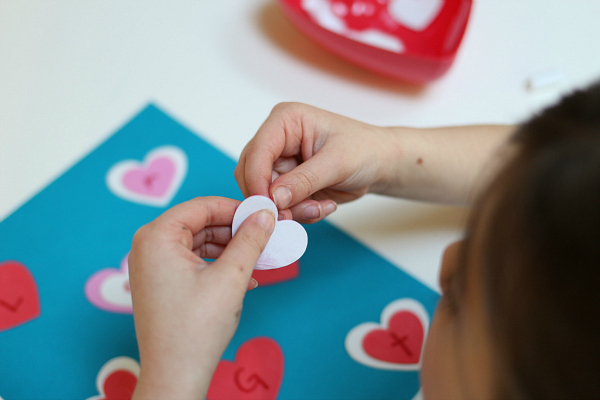 Mosaic Heart – scissor skills are important, and they combine many fine motor skills while also boosting children’s sense of self-efficacy! 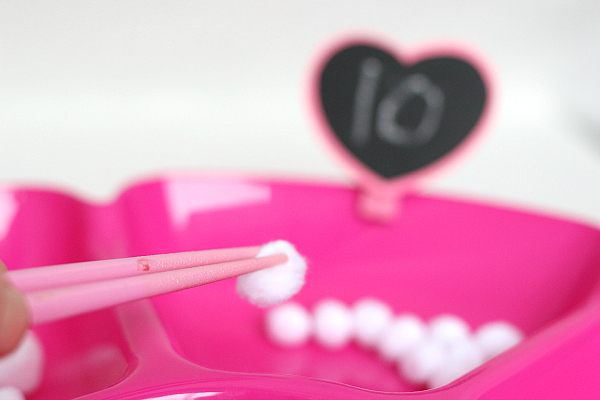 Valentine’s Day Math Tray with chopsticks – even without the chopsticks this math activity with tiny pom poms would help develop fine motor skills. 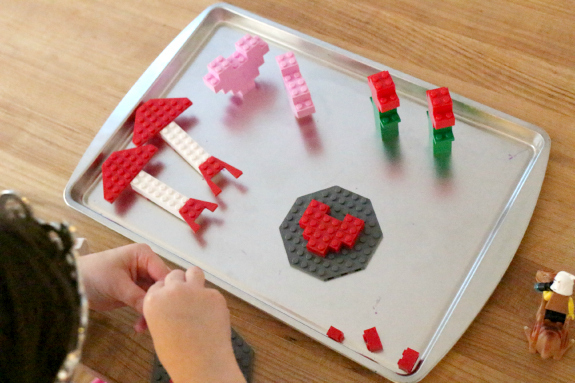 Valentine’s Day Lego Challenge – I LOVE Lego and not just because it gets kids into a maker mindset but because for many children who would rather build than write it offers a fun way to build creations and fine motor skills all at once. 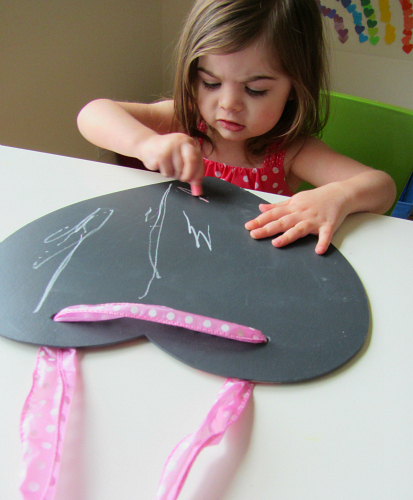 Chalkboard Hearts – Chalkboards are fantastic for kids just starting to make marks on their way to writing. 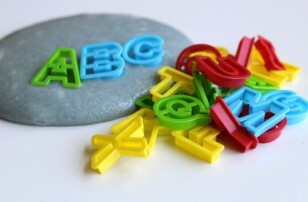 The friction they offer helps children develop hand control as they try to make shapes and letters. 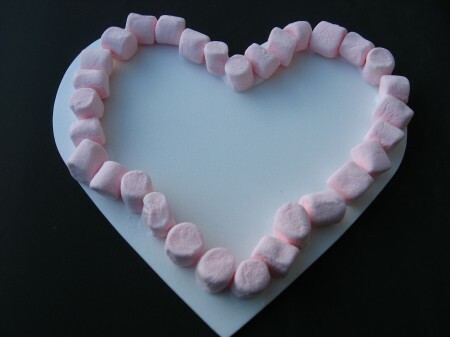 Marshmallow Heart – Carefully placing mini marshmallows on the heart takes effort and popping the others into your mouth is tasty! 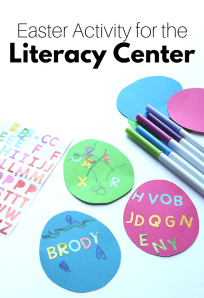 Valentine’s Day sticker letter match Stickers are second only to Lego for my favorite way to work on fine motor skills. Peeling off those backings is great control practice and stickers are cheap! 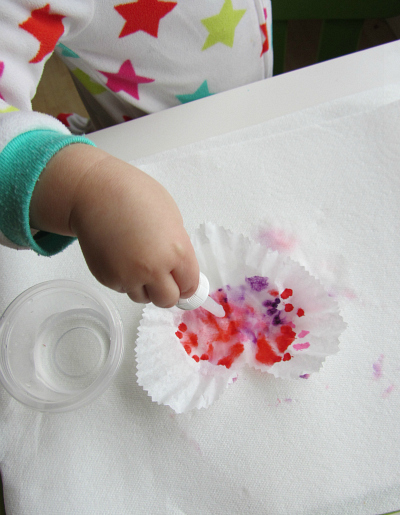 Coffee Filter Hearts eye droppers are another great tool for fine motor development. 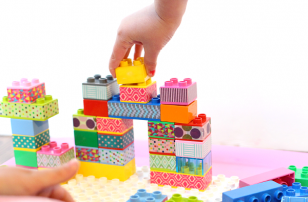 Controlling when and where to pinch and release is fun and not too messy. 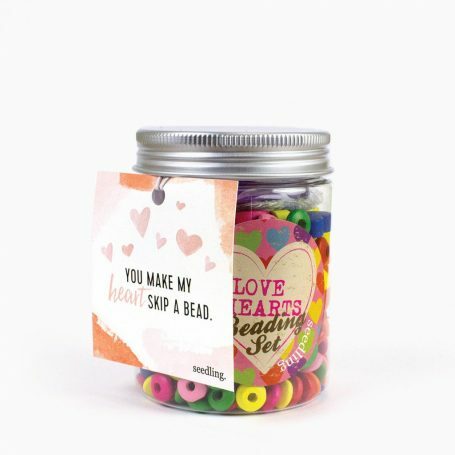 If you are looking for a great Valentine’s Day gift that promotes fine motor development, I found this over at Seedling – how cute?! 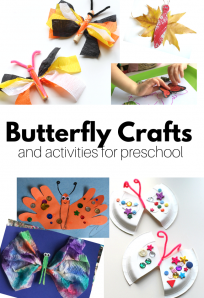 Of course, you could make one too but who has time for that these days?